Kyle Larson, driver of the No. 42 Target Chevrolet, sits in his car during practice for the Monster Energy NASCAR Cup Series Overton&apos;s 301 at New Hampshire Motor Speedway. LOUDON, N.H. – The fastest car in Friday’s qualifying session may have been just that for a reason. 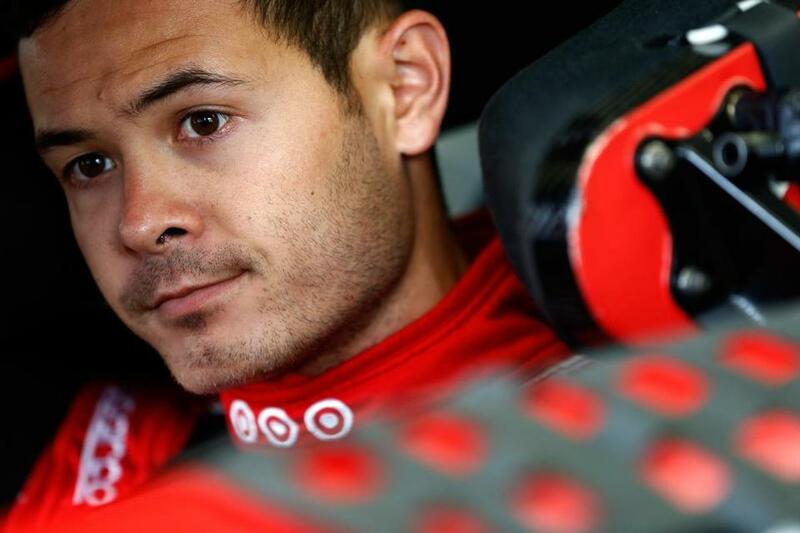 Kyle Larson buzzed around New Hampshire Motor Speedway at a class-best 133.324 miles per hour. But NASCAR threw out Larson’s time and relegated the Chip Ganassi Racing driver to the 39th and final starting position for Sunday’s Overton’s 301. The No. 42 Chevrolet failed post-qualifying inspection because of an illegal rear deck fin lid. Martin Truex Jr., whose 133.077 m.p.h. lap was bested only by Larson’s, will start on the pole on Sunday. This is the second straight weekend NASCAR has found something fishy with the No. 42. Following post-race inspection last weekend at Kentucky Speedway, the No. 42 was found to have raced with an illegal rear brake assembly. Larson, then atop the standings, was docked 35 points. Crew chief Chad Johnston was fined $75,000 and suspended for three races, starting with Sunday’s event. Johnston, considered persona non grata at Loudon, was replaced by interim crew chief Tony Lunders. It seems Johnston’s temporary replacement has some explaining to do, maybe even to his driver. The 24-year-old Larson is responsible for making his car go fast. He did that well enough in both practice and qualifying on Friday. Larson, however, is not responsible for the car’s widgets, especially those tasked to slow down the No. 42 Chevrolet. So when asked about the illegal rear brake assembly that NASCAR sniffed out at Kentucky, Larson responded with a shrug. Larson was excellent in Friday’s practice in both qualifying and race trim over 26 laps. His hottest practice lap was 133.971 m.p.h., trailed again by Truex (133.217 m.p.h.). Larson’s practice performance gave him confidence heading into qualifying, which was delayed slightly because of afternoon rain. Larson thought he had snatched his fourth pole of the year, most of any driver. One of Larson’s only concerns was Truex. The No. 78 ran only one lap in each of the first two rounds of qualifying. In theory, with minimal tire wear, Truex would be able to rip off a screamer in the final round. It didn’t happen. But following the dismissal of his qualifying lap, Larson will have heavy lifting to do on Sunday. Larson’s best career Loudon result is second in September of 2014. He started the race in 10th place. The lowest he’s started at New Hampshire is 17th in July of 2015. Larson limped home in 31st place. It will be a tall task for Larson to nudge past his 38 competitors on Sunday, even if his car is legitimately good. Drivers find it hard to pass at Loudon, where a fast qualifying run is as good as gold. The No. 42 team’s misstep gives Truex and the No. 78 Toyota more room to run up front. Truex was initially disappointed because he believed he had finished second in qualifying for the sixth time this season. But now with clean air in front and his chief competitor at the back, Truex will be free to fly once the green flag drops. Truex leads Larson by 34 points. The No. 78 has won three races, including last Saturday’s Quaker State 400.